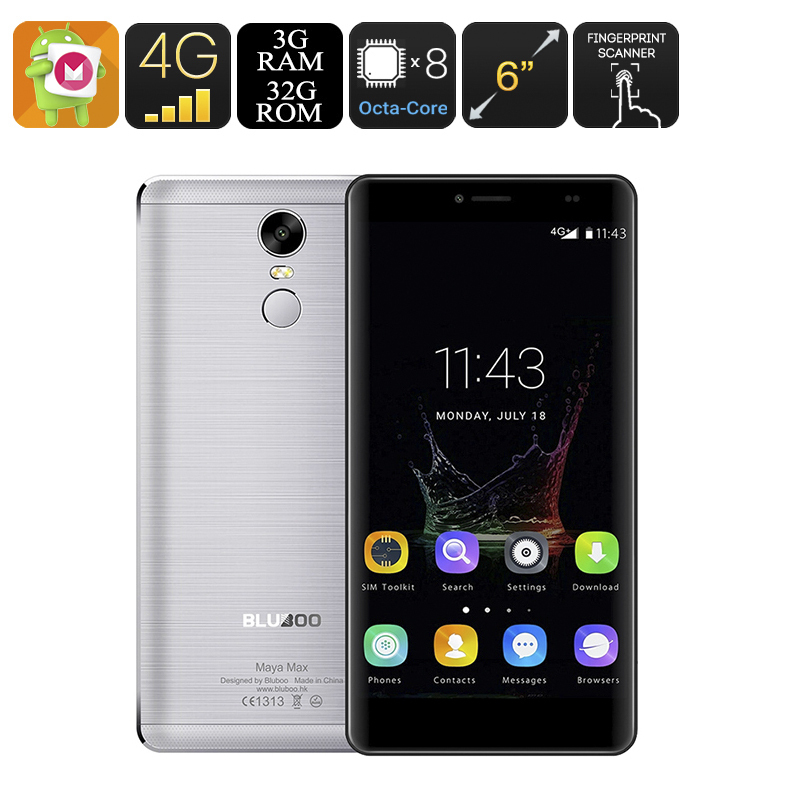 Successfully Added Bluboo Maya Max Smartphone - 6 Inch Screen, Android 6.0, 4G, OTG, Smart Wake, Fingerprint, Octa-Core CPU, 3GB RAM (Grey) to your Shopping Cart. The Bluboo Maya Max is a 6 Inch Android phablet that features an astounding display designed to let you enjoy all your favorite media in mesmerizing quality. Its JDI display features OGS technology that brings bright, sharp, and rich visual experiences. Supporting HD resolution the Bluboo Maya Max smartphone lets media come to life in the palm of your hand, allowing you to experience a true cinematic experience. Running on an Android 6.0 Operating System this Chinese smartphone lets you enjoy a smooth user experience along with the latest features and software the mobile industry has to offer. Take a scroll through the Play Store and download one of the millions free to download Apps, games, movies, and more which can be enjoyed to their absolute most of the phone’s 6 inch HD display. Thanks to its Octa-Core processor and a stunning 3GB of RAM the Bluboo Maya Max will be capable of running the latest and most demanding media without dropping a single frame – letting you enjoy a magnificent mobile entertainment experience. A massive 32GB of internal memory that can be backed up by an additional 64GB or storage lets you enjoy enough space for you to save all your files. At the back of the phone an ultra-fast fingerprint scanner is placed to let you protect all your stored data in the most secure and up to date manner. Additionally this Android phone features Smart Wake technology that lets you open your favorite apps straight from your locked phone without having to navigate through your smartphone yourself. Offering Dual-SIM slots and holding two IMEI numbers this Chinese phone allows you to be reachable on two different phone numbers simultaneously, making the Bluboo Maya Max the perfect device to separate business and private life by using just one device. Additionally, the possibility to be connected to two different 4G network providers allows you to be constantly connected no matter where on the globe you’re located. Its 4200mAh battery lets you enjoy up to 8 continuous hours of usage time, enough for you to browse the web, watch movies, or stay connected with your friends throughout the day without ever needing to worry about battery life. The Bluboo Maya Max comes with a 12 months warranty, brought to you by the leader in Android phones as well as wholesale electronic gadgets..